Mount Athos has a unique administration status, and is run by its own local administration authorities. 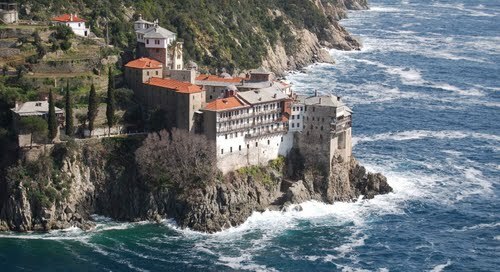 There are 20 monasteries and approximately 2,000 monks in Mount Athos. Some of them live in the monasteries, while others prefer to live in complete isolation, in a skete, which is where monks reside in order to stay away from earthly distractions. Monks believe that, in this way, they can come closer to God. 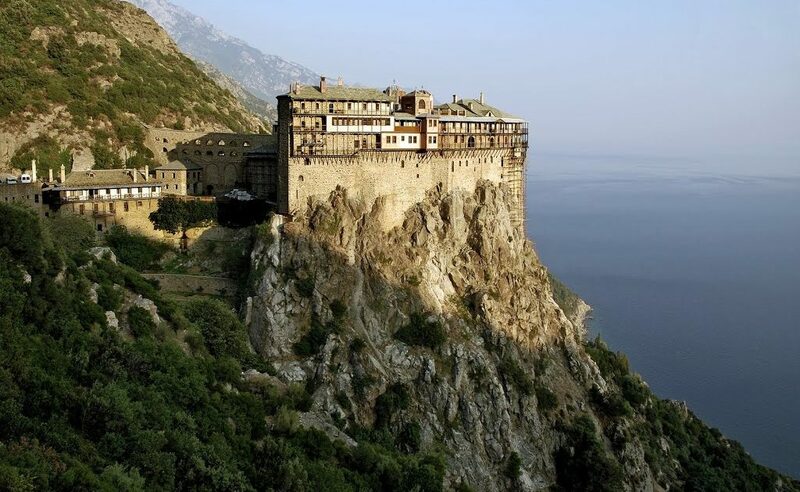 The pious monks of Mount Athos are dedicated to praying, but they also spend a lot of time performing other tasks, such as cleaning the guest houses, mending the ancient old monasteries, growing vegetables, making wine, and preparing dinner. Meals are solely made with local produce, usually vegetables and legumes, and are accompanied either with water or wine. Women are not allowed to visit this part of Chalkidiki, and even female animals are kept away from Mount Athos. According to tradition, while sailing near the Athos peninsula Virgin Mary encountered a terrible thunderstorm, and disembarked in the area where the Iveron Monastery lies today. There she prayed to have this place as her own. It is also widely believed that the main reason against the presence of women in the area is that it would distract the monks from the word of God. Since only male visitors granted a special permit are allowed to access Mount Athos, you can rent a boat in Vourvourou and cruise around Mount Athos, an ideal way to catch a glimpse of this unique place. Sailing at 500m from shore, at the closest distance allowed, one has the chance to admire the magnificent architecture and beauty of the monasteries. This holy place has remained one of the most unspoiled parts of Greece. Its wild landscape is stunning, with a backbone of mountains, covered in dense pine forests. The monasteries are built in the most unexpected spots, next to lush vegetation and gorges. This unique region is also surrounded by blue waters and numerous coves. The landscape of Mount Athos, an interface of spirituality and natural forces, has been carefully preserved, offering visitors an out-of-this-world experience. Wouldn’t you like to admire one of the best locations in Greece, and the rare architectural beauty of more than 20 Christian Orthodox monasteries? This is an opportunity you simply cannot miss! Send us an enquiry about this special cruise with Dream Swim boat rental company, and we will take you on a cruise around this region of unparalleled beauty.